All-around/Multi-terrain shoes have been the favourable choice for many people because of the simple, very obvious fact that it can be used on all kinds of terrain. Not only is it a bargain for the wearer, but it is also convenient that they do not have to change footgear ever so often. In the world of sports, these versatile shoes are even more important, because the field may not always be the same one that you are playing on. 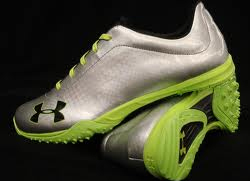 So for multi-terrain sports, it’s best that you have a pair of Under Armour ATV turf shoes to use. Many sports shoes focus on preserving the wearer’s speed, as it is the foundation of an athlete’s overall strength and performance. The same also applies to Under Armour ATV turf shoes, as it is also treated with a considerable degree of weight reduction to help boost the player’s performance. However, more than a raw boost in speed, Under Armour ATV turf shoes actually emphasize more on protection and overall (yes, overall) comfort. This is evident in the application of features like ArmourBound and ArmourGuide, and the exclusion of the Micro G feature. With both features working in tandem, your feet are well protected from any physical impact, blow or shock that would have otherwise incapacitated you from the game. Some of you who have already used Under Armour ATV turf shoes may have raised an eyebrow when we mentioned the term “overall comfort”. Before some of you start pointing at the tip of their shoes, let us explain what we mean first. We mentioned the term because, if we rate the level of protection Under Armour ATV turf shoes have as a whole, it is sufficiently adequate. Proper cushioning added with breathability allows the muscles to flex, contract, and stretch freely without too much constraint ON ALL SIDES. The FootSleeve feature, while not 100% perfect, gives the foot just enough space for it to fit nicely inside the shoe. So all in all, it might be a different kind of comfort, but it is still a good level of comfort nonetheless. Of course, the name ATV turf shoes would be utterly useless without its ability to easily traverse different kinds of terrain. Ground traction and grip is a very important element and quality of any sports shoe. It helps the athlete position themselves properly, and allows them to easily estimate speeds and distances needed to form proper split-second decisions throughout the game. Again, this is most important if the sport is played on a field with different terrain types, such as softball and baseball. With the specially designed turf outsole of Under Armour ATV turf shoes, the fear of losing your footing is now clearly eliminated. These all-around shoes sacrifices a little bit of your speed in order for you to traverse terrain more safely. The shoes’ design revolves around the idea of overall comfort, rather than trying to pin-point possible areas of frequent impact. Ground traction is its most important feature, allowing wearers to keep their feet planted firmly to the ground, ready to switch and change positions at the snap of a finger. The emphasis on protection and the custom specifications of ATV turf shoes might seem to be a turn-off for a few people. After all, you’re not really going to achieve maximum comfort if the shoe is a little bit too narrow for you. But the level of protection and ground traction that it provides is all worth the trouble of a narrow toe box.